A guest cottage of a country inn in Northern California. The play will be performed with one intermission. SAME TIME, NEXT YEAR was first performed March 13, 1975 at the Brooks Atkinson Theatre, New York, N.Y. It was Directed by Gene Saks and starred Ellen Burstyn and Charles Grodin. SALLY DiDARIO, RACHEL CONNORS, JOSEPH TIERNO, ROBYN RESKO, TOMMY DiDARIO,JR. Dawn is thrilled to be a part of the Dunellen Theatres premiere season. She is also happy to be working with Ken again, having appeared with him in the title role in Mary Mary at the Hunterdon Hills Playhouse. Other HHP credits include Ruth in Blythe Spirit and Alison in Romantic Comedy. Off-Off Broadway she has performed in productions of Waiting for Lefty, Haiku, Attic and Twelfth Night. Some favorite roles include Helen in Baby with the Bathwater and Lady Caroline Dester in Enchanted April. She also portrayed Ruth in the Bickford Theatres Dear Ruth, which won the NJ Theatre Award for Best Revival of a Play. Dawn has done numerous TV commercials, as well as work on soaps, cable TV, and independent films. Dawn would like to welcome into the world her two new nieces Catie and Sofia. Love and thanks to Greg. Born in Plainfield, ken has appeared in commercials, film and well over 70 plays at regional and professional theatres. Some of his favorite leading roles have been in such plays as Happy Birthday, Wanda June, Jimmy Shine, A Streetcar Named Desire, The Lark, Barefoot in the Park, Never Too Late, Come Blow Your Horn, Charleys Aunt, Catch Me If You Can, One Flew Over The Cukoos Nest and Say Goodnight, Gracie. 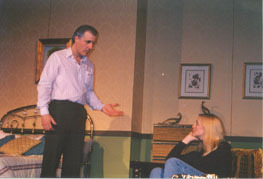 Ken also wrote, designed and starred in Yuletide Hearts, an original holiday play at Hunterdon Hills Playhouse. The production was subsequently named one of the best new plays for N.J.s 1997 professional theatre season by The Star Ledger. , Any Wednesday and Sugar. Some of his favorite appearances have been in such plays as The Odd Couple, Born Yesterday, Send Me No Flowers, Three Men On A Horse, When We Are Married, Charleys Aunt and Ken Schwarzs Yuletide Hearts. A Holiday Music & Comedy Show For the Whole Family!